Alliaria petiolata.bugwood.org.Victoria Nuzzo, ed. J. Randall, Global Invasive Species Team, The Nature Conservancy (Accessed 3/2014). 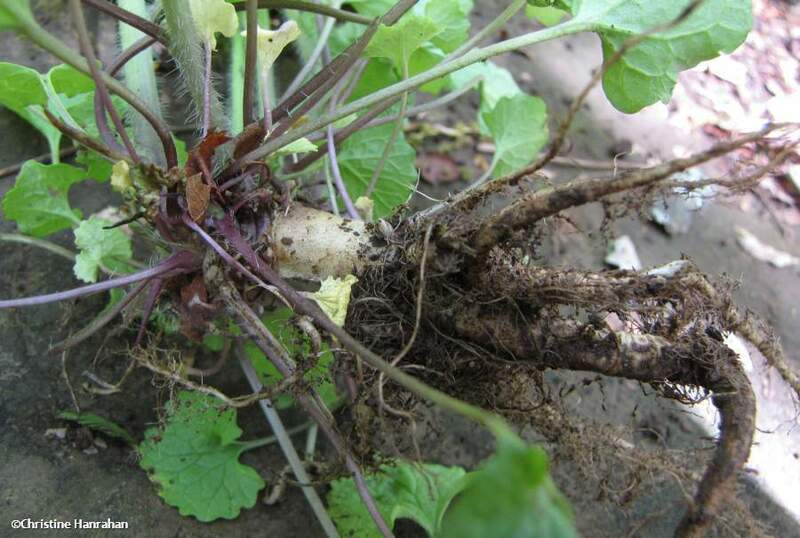 Alliaria petiolata (garlic-mustard)-long-roots. ©Christine Hanrahan. Fletcher Wildlife Garden. fletcherwildlifegarden.wordpress.com Accessed 8/2017). Alliaria petiolata is a biennial or winter annual herb, becoming 5 cm to 1.9 m tall in flower, taprooted, initially forming a leafy rosette, then a simple or sparsely branched flowering stalk, robust plants sometimes with several stalks (Nuzzo 2005). Alliaria petiolata (garlic-mustard)-basal-rosette-first-year-plants. ©Christine Hanrahan. Fletcher Wildlife Garden. fletcherwildlifegarden.wordpress.com (Accessed 8/2017). Leaves alternate, young leaves with garlic smell when crushed, surface puckered, margins toothed; stalk of basal and winter rosette leaves 3-10 cm (see photo below), hairy, blade 2-12 cm wide, kidney shaped, dark green; stem leaves of flowering plant with stalks, blades 3-8 cm long, becoming smaller upwards, deltoid (Cavers et al. 1979). Alliaria petiolata flower. upload.wikimedia.org (Accessed 8/2017). Flowers white, radially symmetrical, 4-parted, 0.6-0.7 cm wide, petals 0.3-0.6 cm long, spatula-shaped, narrowed to base, sepals 4, green, stamens 6, 4 long ones, 2 short; inflorescence initially of dense clusters, outer buds opening first, stem elongating into racemes at top of stem and in sometimes in upper axils, continues to bloom at apex while forming fruit below; blooming April-May; pollinated (or visited) by honey bees (Apis mellifera), bumble bees (Bombus sp. ), small carpenter bees (Ceratina calcarata), all in the family Apidae, also bees in the families’ Andrenidae (Andrena sp.) and Halictidae, midges and syrphid flies which are attracted to the flower’s nectar and pollen but flowers also self-pollinate if not insect pollinated, resulting in very high rate of fruit set (Cruden et al.1996). Alliaria petiolata (garlic mustard) developing fruit. By Glen Mittelhauser. Copyright © 2017 Glen Mittelhauser.New England Wildflower Society, gobotany.newenglandwild.org (Accessed 8/2017). Fruit dry, hollow, a linear pod (silique) 2.5-6 cm long, 0.2 cm wide, with 10-20 round, cylindrical, black seeds 0.3 cm long. 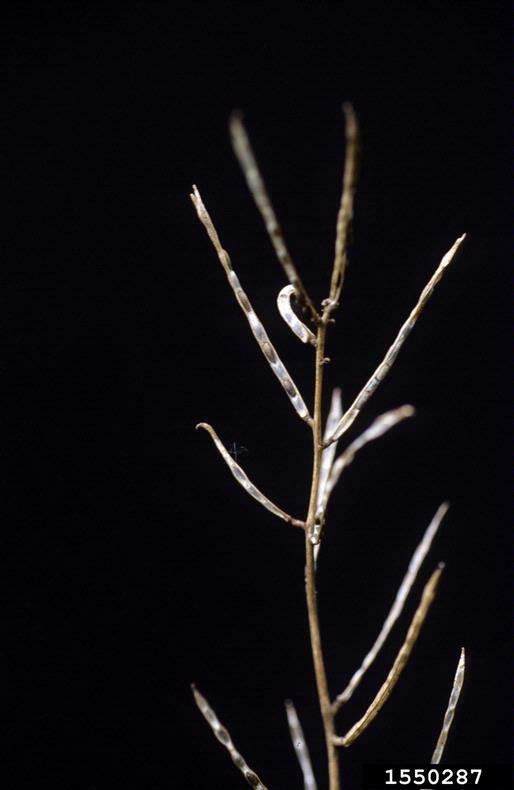 Fruiting in July; stem and pods persistent through autumn, all seeds are shed by Nov.1 (Cavers et al. 1979); over-winters as basal rosettes or seeds. Seeds show strong dormancy, germinate March-April of second spring after being shed. Second year rosettes produce flowering stems in April. Seeds do not persist in soil for long periods of time (McCarthy and Hanson 1998). Habitat: Moist woodlands, shady edges on disturbed soil, trail sides. Alliaria petiolata (garlic mustard) old fruit & seeds. bugwoodcloud.org (Accessed 8/2017). Notes: An aggressive, shade tolerant invasive. Listed as one of the “top twenty” invasive alien plants by the NYS Natural Heritage Program’s Ad hoc committee on invasive plants. Covers large areas in forest and woodland understories, especially second growth and disturbed areas along trails, displaces native herbs by shading. Produces a dense low canopy in early spring before native herbs emerge that may shade out spring ephemerals and emerging herbs and seedlings (Nuzzo 2005). 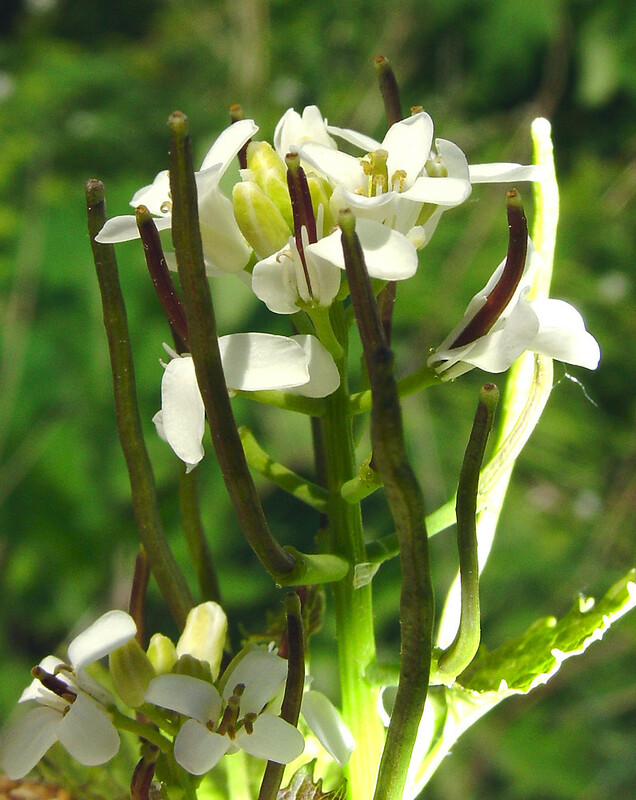 Garlic mustard produces various secondary chemicals including toxic glucosinolates that act as attractants to specialist European herbivorous insects which are absent in North America (Cavers et al. 1979; Cipollini 2002). 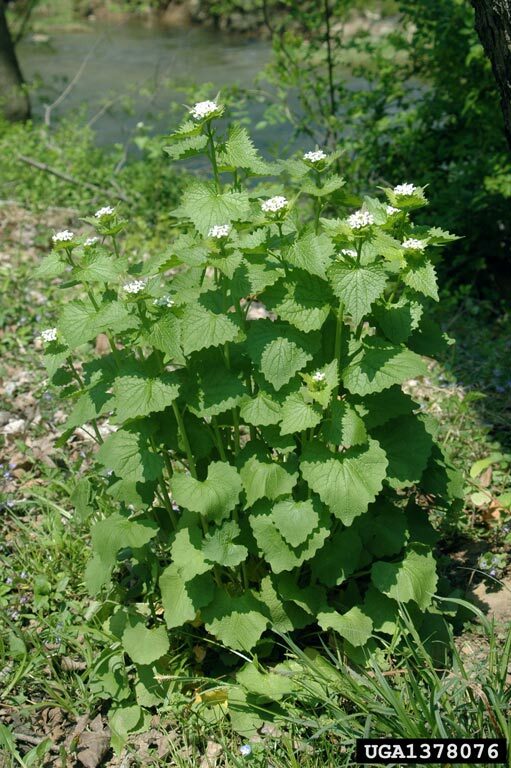 Garlic mustard is not seriously attacked by any insects in North America (Nuzzo 2005). Produces two proteins, a trypsin inhibitor and a peroxidase, toxic to herbivores and pathogens (Cipollini 2002). Probably does not have allelopathic effects on the plants it displaces (McCarthy and Hanson 1998). Intolerant of acid soils (Young 1996). In NYC found on soils with pH 5.2-7.7 (Gargiullo unpublished data). Tolerant of highly varied habitats from flood plain forest to old railroad beds, putting more effort into seed production in drier, more stressful habitats (Byers and Quinn 1998). Appears to prefer high nutrient soils and higher light levels, factors that may increase its ability to invade a site (Meekins and McCarthy 2000). Edible as salad or as cooked greens before flowering. 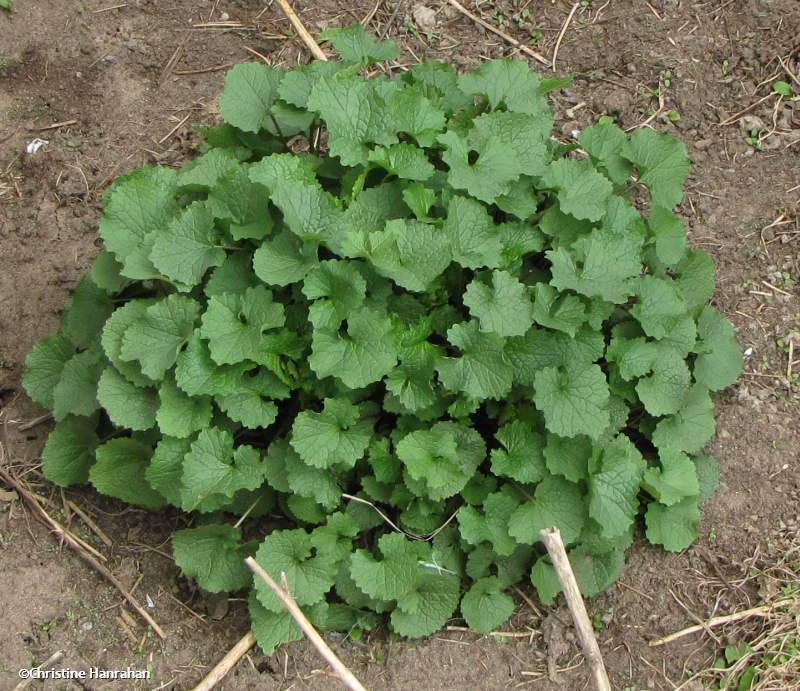 Garlic mustard produces several secondary compounds related to mustard oils that may help it grow at temperatures close to freezing in fall and early spring (Cavers et al. 1979). Most plants in the family Brassicaceae do not form symbiotic relationships with VA mycorrhizas. They are one of only a few plant families that do not have mycorrhizal roots (Smith and Read 1997). Garlic mustard is sometimes infected by pathogenic fungi, including Alternaria alliariae officinalis, Ramularia armoraciae (Deuteromycotina, Hyphomycetes), Peronospora parasitica (Mastigomycotina, oomycetes). It may also be susceptible to infection by a mosaic virus (Cavers et al. 1979; Agrios 1988). 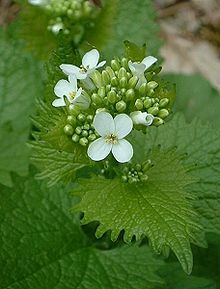 Garlic mustard first recorded on Long Island about 1868. It was likely introduced by settlers for food or medicinal purposes (Rowe and Swearington 2003). Leaves are edible cooked or raw before flowering begins (as with dandelion greens).